We are inspired by photographers—their creativity and their talents—every single day. We designed this program, CREATE. CAPTURE. INSPIRE., to support photographers and the photography industry in the overall print effort. It's an easy and FUN way to share with others how you PRINT, PACKAGE, and SELL your prints to clients. Presentation is everything. Packaging prints—in folders, boxes, albums, folios, mats—not only helps protect and preserve the pictures that they hold, it also adds value to the finished package. When you deliver prints to your clients in a professional way, it elevates your work and increases the perceived value of those prints. We understand the value and importance of packaging prints to sell prints for profitability. We also understand the value of packaging prints in a way to preserve the memories they capture. But do your clients? People are taking more pictures than ever before—help your clients understand the value in showcasing and preserving their memories by displaying their prints. As a photographer, you have a huge social network, a captive audience ready and waiting to swoon over the pictures you share. Attract clients by posting pictures of your prints, packaged and ready for delivery. Showcasing the complete package with custom keepsakes will spark memories of the unforgettable experience you created for your clients and keep them coming back for more. At the same time, sharing your work will intrigue potential new clients, and inspire other photographers—sparking new-creative ideas about how to print, package and sell prints to their clients. It’s as easy as SET. SNAP. SHARE. Using a mobile device and one of the many—cute and quirky—CREATE. CAPTURE. INSPIRE. backdrops (or you can always use one of your own! 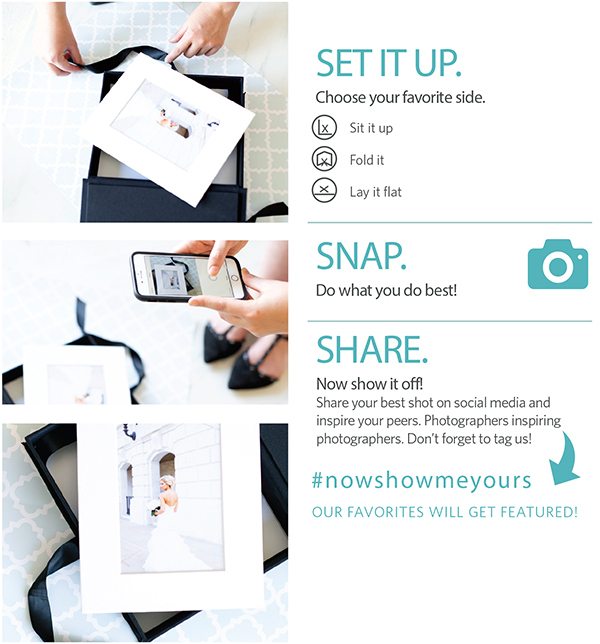 ), you can snap a quick picture of your photo packaging, then share & tag it with your social communities. We want to see how you package and sell your prints—share your work and inspire others. Don’t forget to tag us! Download our backdrops for free and print them at home! Want to learn more about the print effort? Visit www.printmovement.org for more information.